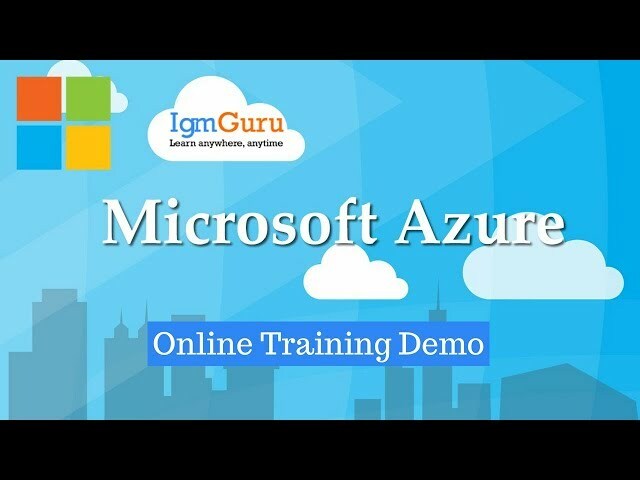 IgmGuru’s Azure Developer Online Training program is designed according to Developing Microsoft Azure Solutions: 70-532 Certification Exam to make a sure candidate pass the exam in the first attempt. Decide about Microsoft Azure improvement condition to take a current ASP.NET MVC application and investigate its usefulness to Azure. Gain in-profound information on Azure stage highlights to create and convey cloud applications, design and send web applications, make and arrange Azure virtual machines. Azure Developer Online training program is designed to give you mastery in Microsoft Azure enterprise-grade cloud platform. Through demos & practical applications, you’ll grasp to design, develop, implement, automate, and monitor resilient and scalable cloud solutions on the Azure platform. This course will make you explore Microsoft Azure development environment and Azure platform features and learn development tools, techniques and approaches used to build and deploy cloud apps. In what capacity will I turn into a guaranteed Microsoft Azure 70-532: Developing Microsoft Azure Solutions? A :Online Classroom training for 70-532 is a live training via online live streaming of a class. This is run by Microsoft certified trainer with over 15 years of work experience in the domain and training. The class attended by the global audience can enrich your learning experience. You just need headphones for rich audio experience. Q : Is exam fee incorporated in the course fee? A :No. The exam fee excluded in the course fee. Q : Who are the educators for the live classroom training? A :All Our Trainers are Microsoft certified and highly qualified with over more than 10 years of experience in training and are working in the domain. Q : How do I get in to Azure Platform?